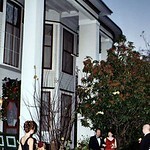 Many beautiful Weddings/Events, both large and small, have been hosted at Inn. The entire facility may be booked for your wedding or special event. Call today to set up a meeting to let us help you make your event especially memorable at the historic Pecan Street Inn.